This is a story of a regular guy whose best friend buys a fake mustache at a novelty shop and suddenly becomes a brainwashing, evil genius. 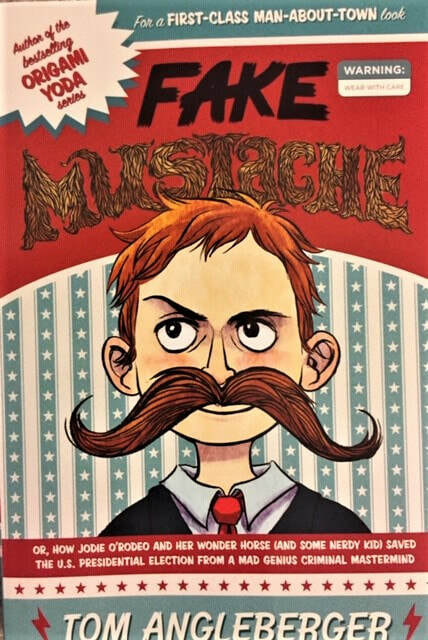 With the help of teen TV star, Jodie O'Rodeo, Lenny is determined to save America from Fako Mustacho, before it's too late. There's little here that will make you reflect about the meaning of life, but there's a lot that will make you laugh. Lots of potential reader appeal about a regular guy in increasingly bizarre circumstances. The book does suggest that readers examine how quickly they are to follow celebrities, trends, and messaging, and whether or not they think for themselves, which is a worthwhile goal. And then Lenny uses his novelty sticky hand to steal a reporter's crab rangoon from the buffet. I'm not convinced it was necessary to change to Jodie's point of view in the middle of the narrative, but it works out. I appreciated that Jodie's celebrity was a little unusual instead of a cliched pop princess. I mean, her onscreen persona yodels. This book is a good example of how a light read doesn't have to be predictable; its strength is its strangeness. Enjoy! "May I ask - did the seventh grader even have a mustache?" "Of course not, Angie. He did have a suit, but it was more of a hard-nosed business suit than a man-about-town suit. It was nothing but a waste of time and resources for the department." "I threw the costume down in disgust. It seemed really creepy to dress up like a girl that I have a crush on. Really creepy! But it was only four dollars, and I couldn't find anything else."